Without thinking, I take on its stillness. My breathing slows, focus sharpens. for a moment, in this bird’s image? if only briefly, large against the sky. where a birch tree leans over water. white branch hanging over water. 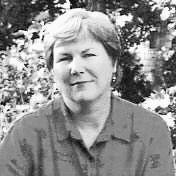 Ginny Lowe Connors is the author of Barbarians in the Kitchen (Antrim House Books, 2005) and editor of three poetry collections, including Proposing on the Brooklyn Bridge (Grayson Books, 2003). She has won numerous awards for her poetry, including the grand prize in Atlanta Review’s International Poetry Competition. One of her poems has been nominated for a Pushcart Prize. An English teacher in West Hartford, Connecticut, Connors was named “Poet of the Year” by the New England Association of Teachers of English a few years back. Her poetry appears in many literary magazines and anthologies.